This article is about a type of device in Mario Party 5. For information about a collectible toy dispenser in Donkey Kong Country: Tropical Freeze, see Capsule Toy Machine. 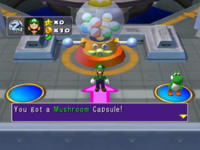 Capsule machines appear only in Mario Party 5, and as their name implies, dispense capsules to players. If a player passes a capsule machine, they can get a random capsule for free. Capsule machines are based off of the real-life Gashapon machines, sometimes known as capsule machines. Capsule machines have bolts for eyes and a yellow mouth where the capsules come out. They also sport two yellow rod-like arms with blue balls on the end. In the official Mario Party 5 guide, Mario mentions he introduced capsule machines because he wanted the capsules to be free, although later in Mario Party 6 and Mario Party 7, Orb Huts replace capsule machines and Orbs now need to be bought by trading coins. However, free Orbs in those two games can still be obtained from Orb Spaces. After every minigame, Eldstar can be seen with three capsule machines as the game saves. This page was last edited on March 20, 2018, at 13:04.